From no. 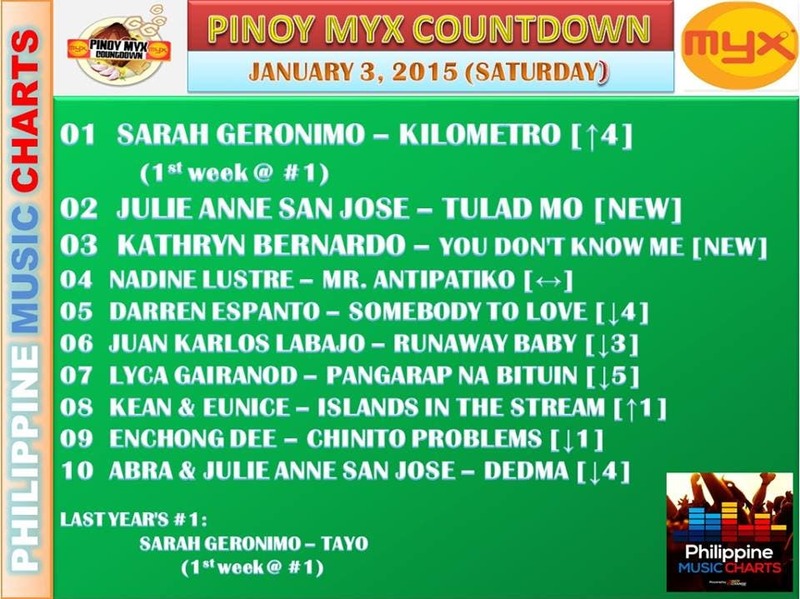 4 last week, Sarah Geronimo captured the no. 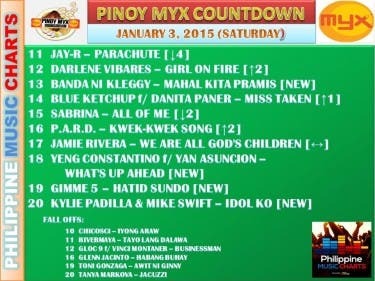 1 spot of Pinoy MYX Countdown this week with her music video for "Kilometro." 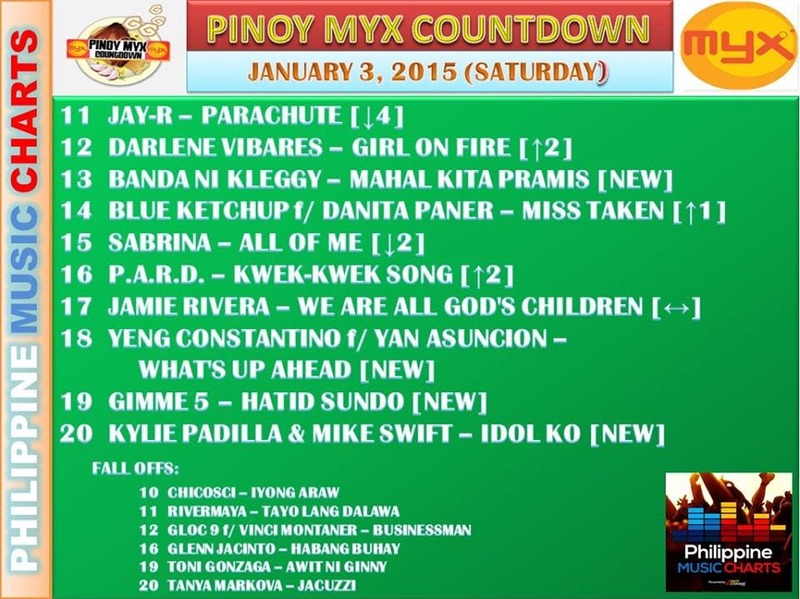 Julie Anne San Jose and Kathryn Bernardo debuted at no. 2 and no. 3, respectively. Last week’s leader–Darren Espanto–dropped 4 notches down to no. 5 this week. Highest debut this week is Julie Anne San Jose with her newest single from GMA Records titled “Tulad Mo” where she showcased her rapping skills aside from her singing prowess. Kathryn made an astounding record on the first week of December because her self-titled debut album from Star Music has reached gold status on the day it was released! I prepared julie anne san jose the best true singer. In the 1st place sintunado nya mag play kahit anong instruments, the most especially ang pag composed nang kanta.. saludo ako kay julie anne xympre una ci god dahil blessed niya c julie. Nasa kanya na ang lahat walang labis walang kulang so dapat c macho ang maging no.1. Si Kathryn not a singer . she is a flirt. Boyfriend na si DJ lumalandi pa kay Dom. Roque halatang halata. Do the so called BULK BUYING .iyan ang trend ngayon para mag number one palag i. True singers deserves to be at top 1. Julie Anne San Jose and Sarah Geronimo are the true singers. 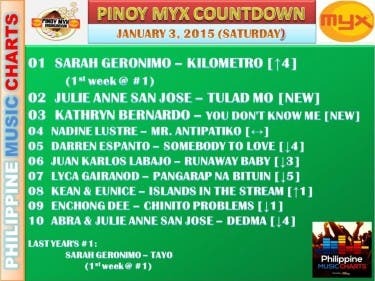 JULIE ANNE SAN JOSE, Deserves To Be At Top 1 . Sarah deserves to be the # 1,because she’s the Best & she’s really Great. Keep it up. Sarah G.
Go Popstar Royalty Sarah G!! !